The following are court results for the Observer area from Hastings Magistrates’ Court from February 2 - February 8. Kirk Gigard (aged 35), of Farley Bank, Hastings, pleaded guilty to being in possession of a quantity of cannabis, The offence took place at Hastings on January 19. He was fined £80. Conor Hodge (aged 21), of Priory Road, Hastings, pleaded guilty to being in possession of a quantity of cannabis, The offence took place at Hastings on August 15 last year. He was fined £80. Richman Mawela (aged 39), of The Green, St Leonards, pleaded guilty to driving a Vauxhall Zafira on Bexhill Road, St Leonards, on January 19, while over the drink drive limit. He gave a breath alcohol reading of 43 microgrammes. The legal limit is 35mg. He also pleaded guilty to driving with no licence or insurance. He was fined £250 and banned from driving for 38 months. Kelly Rider (aged 43), of Crowborough Road, Hastings, pleaded guilty to seven charges of fraud amounting to £4,010. The offences took place between January 1 2015 and November 30 2016 when she was working as an agent for Park Retail Ltd. She was committed to Lewes Crown Court for sentencing. Dayne Hawkings, (aged 18), of The Lodge, Bexhill, was found guilty of two charges of assault by beating. The offences took place at Hastings between June 1 and July 3 last year. The court made a community order with a requirement of 100 hours of unpaid work and ordered him to pay £200 in prosecution costs. Magistrates also issued a restraining order. Sajid Bashir, (aged 45), of Guildford, Surrey, pleaded guilty to driving on The Ridge, at Hastings, on December 2 with cannabis in his blood stream. He was fined £120 and banned from driving for one year. Carole-Anne Baxter (aged 38), of Milward Road, Hastings, pleaded guilty to stealing razors worth £41.58, from Boots at Ravenside, on July 7 last year. She also pleaded guilty to being in possession of eight wraps of cocaine at Milward Road, on December 7. The court made a community order with a drugs rehabilitation requirement. Ivans Blinovs (aged 40), of Marina, St Leonards, pleaded guilty to failing to provide a specimen, when required to do so by police under the Road Traffic Act. The offence took place at Hastings on January 21. He was fined £120 and banned from driving for one year. Anuriskumar Thamotherampillai (aged 49), pleaded guilty to assault. The offence took place at St Leonards on January 20. He was given an 18 month conditional discharge. Colin Weskin (aged 44), of Waterworks Road, Eastbourne, pleaded guilty to stealing food items worth £44.98, from Tesco at Hastings, on January 19. He also admitted being in breach of a conditional discharge for four previous offences of shoplifting. He was given a 12 month conditional discharge. Wendy White (aged 47), of St Helens Down, Hastings, pleaded guilty to driving an Audi car on St Helens Road on January 22, while more than twice over the drink drive limit. She gave a breath alcohol reading of 76 microgrammes. The legal limit is 35mg. She was fined £200 and banned from driving for 18 months. Ryan Williams, (aged 32), of St Edmunds Close, New Addington, Croydon, Surrey, pleaded guilty to being in possession of a lock-knife in a public place. 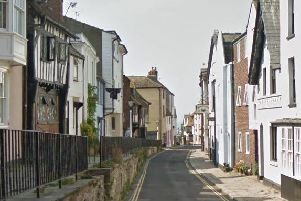 The offence took place at London Road, St Leonards, on January 23. The court made a community order with a requirement of 150 hours of unpaid work. Mark Butler (aged 42), of Arundel Road, Eastbourne, pleaded guilty to driving without due care and attention. The offence took place at Barnhorn Road, Bexhill on October 18 last year. He was fined £170 and his driving record endorsed with six penalty points. Rolandas Lasickas (aged 36), of London Road, St Leonards, pleaded guilty to driving a Vauxhall Vectra on Sedlescombe Road North, St Leonards, on January 23, while over the drink drive limit. He gave a breath alcohol reading of 66 microgrammes. The legal limit is 35mg. He was fined £120 and banned from driving for 17 months. Jamie Roscoe (aged 26), of Hard Lane, St Helens, Merseyside, pleaded guilty to causing £456 damage to the wing mirror of a vehicle. The offence took place at Hastings on January 11. He was fined £200 and ordered to pay £456 in compensation. Lee Brumby (aged 28), of Lower Glen Road, St Leonards, was found guilty of damaging a computer belonging to Dominos Pizza, Bexhill. He also pleaded guilty to using racially aggravated threatening behaviour. The offences took place at Bexhill on October 3 last year. He was fined £420 and ordered to pay £600 in prosecution costs. Joseph Nelson (aged 18), of Chiltern Drive, Hastings, was found guilty of entering garages, at Sedlescombe Gardens, St Leonards, between October 10 and 11, with intent to steal two motorcycles and tools. He was sentenced to 20 weeks in a young offenders institution and ordered to pay £115 compensation. Magistrates said the reason for the custodial sentence was that the offence involved a degree of planning, the high value of the bikes, and took place just after release from serving time on other matters.